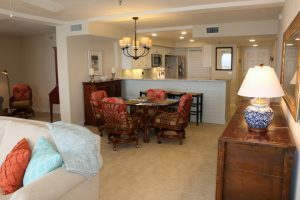 From Sarasota to St. Petersburg and Clearwater to Tampa, Silver Palm Custom Homes & Remodeling has helped condominium owners transform their living space from boring, dated, and inefficient to a modern retreat. Whether you’re a Florida resident only in the winter or spend year round here, your condo should be what you want it to be, not what some builder decided 10, 20, or even 30 years ago. 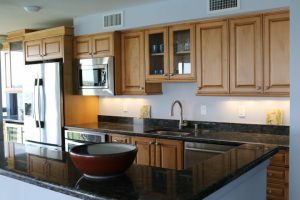 As NARI Certified Remodeler and condo remodeling specialist, we’ve been asked by many owners, “What can really be done, it’s a condo?” Let us assure you that there are many changes, both big and small, that can make an impact on the space. When working on a condo renovation there are really only a few things that can’t be moved or altered; any wall that is part of the support of the building, exhaust pipes, and gas and water. We enjoy taking these older condos that have beautiful views in prime locations and bringing them into the modern era. Condos built before open concept design was popular generally have galley kitchens, separate dining spaces and small living rooms. Why should the only place you can take advantage of your beautiful view be your lanai and living room? 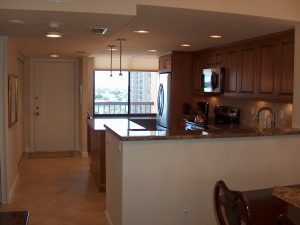 When you set an appointment to discuss your condo renovation project with Silver Palm Custom Homes & Remodeling, we come to you, listen to your needs, take measurements, request floor plans, inspect the space, and work on design options from there. Today’s seniors live a much more social lifestyle than previous generations. Because of this, the layout and features of older condominiums don’t always work. If you are looking to modernize and have better use of your space, we can help. Our designers know how can make over your condo not only so it works better for you but by adding our high quality cabinets, fixtures, and finishes, it will be something you’re proud to show off. Let us visit with you and discuss bathroom remodeling, creating a master suite, or opening up your condo to have better flow and views. We look forward to talking with you about your vision for your condo remodeling project. Call today to schedule your in home consultation (727) 420-6693.